Ironically, as Bec H was blogging last week’s post seasonal homage, the skies were making up for their post apocalyptic summer fever with day after day of rain. Our local Show is only a couple of weeks away. Officially it’s known as the Wallamba District Agricultural and Horticultural Show, a bit of a mouthful, so let’s just stick with ‘The Show’. There’s talk around town about who’s entering what. You can sense the competitiveness starting to simmer. Amongst my friends, we’re agreed that it makes the day more enjoyable if you have items entered. We’re not necessarily in it to win it, but I have to say it’s quite a thrill seeing a blue show ribbon on one of your entries when you wander through the Produce Shed or through the exhibits in the main hall. Ah, there you are! Still here? Wow, I’m impressed. I know, it’s been a while between posts. Let’s just say there’s been a lot going on this year, and Bec C and I have come to realise that unless you actually make cold hard cash from your blog, it tends to take a back seat when the rubber hits the road. It’s happened. We’ve done our first home kill. 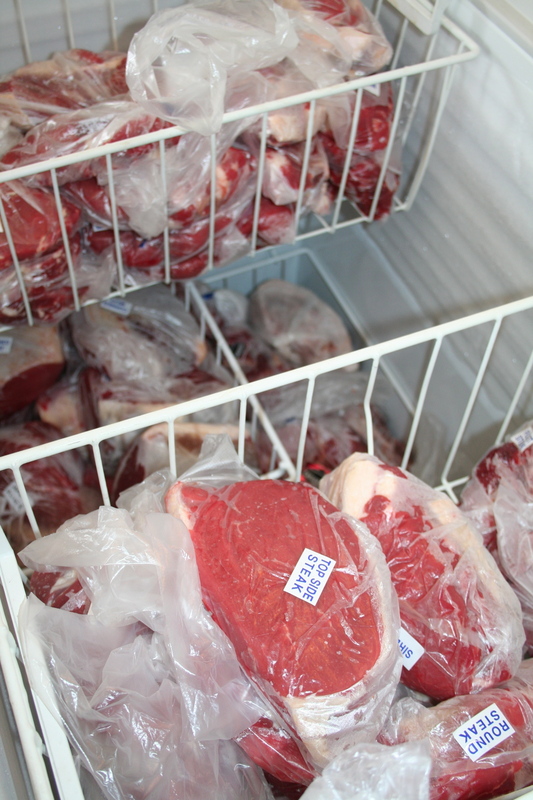 We now have a chest freezer full to bursting of beef. Scotch fillet, sirloin, rump, top side steak, round steak, osso bucco, steak for casseroles and stews, beef for roasting and beef for barbecuing, beef mince and beef sausages. Except for T-bone steaks (we decided against them), you name it, we’ve got. Anyone dining at our place over the coming months, be warned, beef will be on the menu. It’s been another couple of action-packed weeks. Our steers, who’d grown into large, strapping and handsome bullocks, have gone and it wasn’t a particularly smooth process, but more on that in another post. Jones caused absolute havoc at soccer training, and we’ve had the local agricultural show. Time certainly does fly by, and Bec C and I couldn’t believe that it was a year since the last Show, the one that was cancelled due to rain. The Wallamba District Agricultural & Horticultural Show, known to locals as simply the Nabiac Show, went ahead this year without a hitch. The skies were clear and in fact, it was uncharacteristically warm for an autumn day. The Produce Shed, was as we’d all expected, pretty sad. At best, there was half the amount of produce that would normally be on display, thanks (or no thanks) to the long, hot and very dry summer we’ve just had.